In the wake of the recent incident of a lady lawyer being assaulted by members of the Bar at the Tis Hazari Court in Delhi and the subsequent boycott of the court of Additional Sessions Judge Prashant Kumar for directing the registration of a FIR, the Supreme Court bench headed by Chief Justice Dipak Misra noted that the grounds averred by the aggrieved lawyer Afshan Pracha in her plea depict a “sad and sorrowful scenario” and that “the security of practising women at various courts is affected”. Issuing notice thereon, the bench, also comprising Justices D. Y. Chandrachud and A. M. Khanwilkar, directed the impleadment of the office bearers of the Bar Association of the Tis Hazari Courts. Further, the Commissioner of Police, New Delhi has been required to afford police protection comprising women officers of adequate rank to Ms. Pracha so as to enable her to record her statement under section 164, Cr. P. C.
On the request of Senior Counsel Indira Jaising, the bench permitted the statement to be recorded before the Chief Judicial Magistrate, Patiala House Courts. The bench observed, “the petitioner-in-person is scared to go to court without police protection. According to her, her apprehensions are not in the realm of illusion, but of reality”. The bench also restrained the bar association of the Tis Hazari Courts from indulging in strike or boycott at any court. “The strike may only be for one day, but the boycott shall extend indefinitely...she had sought protection from the judge, who directed the lodging of the FIR, and the boycott of his court stems from that...this is a matter of administration of justice...”, submitted Ms. Jaising. “Please treat this as an Article 32 petition...the reason why women are so upset is because this is not a singular instance...there are no Vishaka committees in courts; no place to make complaints (1997 apex court judgment in Vishaka v. State of Rajasthan, stipulating guidelines for tackling the issue of sexual harassment at workplace, required organisations to set up complaint committees)...”, she urged. The Senior Counsel drew the attention of the bench to the plight of the North-East Indian community. In Delhi Judicial Service Association v. State of Gujarat (1991), wherein the Supreme Court had laid down guidelines for the arrest and detention of judicial officers, it had been observed that “The definition of criminal contempt is wide enough to include any act by a person which would tend to interfere with the administration of justice or which would lower the authority of court...The Supreme Court as the Apex Court is the protector and guardian of justice throughout the land, therefore, it has a right and also a duty to protect the courts whose orders and judgments are amenable to correction, from commission of contempt against them. This right and duty of the Apex Court is not abrogated merely because the High Court also has this right and duty of protection of the subordinate courts. The juris- dictions are concurrent and not exclusive or antagonistic...”. In the said case, the apex court had appointed a senior puisne judge of the Allahabad High Court as Commissioner to inquire into the incident involving a Chief Judicial Magistrate and the local police and report back. 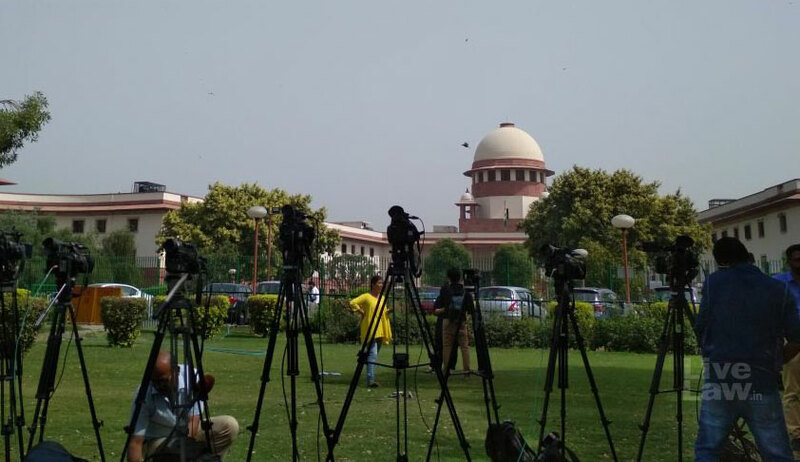 At 3:45 PM on Wednesday, when the petition was heard, the bench had sought to only grant the relief of personal security, observing that the Delhi High Court would have the jurisdiction to adjudicate the other concerns. “Had the situation arisen in any other state and not Delhi, the concerned High Court would have been moved”, the Chief Justice had remarked. The matter is now scheduled to be heard on Friday. Ms. Afshan Pracha, representing an accused in a bail application before Additional Sessions Judge Prashant Kumar, Tis Hazari Courts, Delhi, has alleged that when she was due to appear in the case on May 4, a day the bar was on strike, and was waiting outside the courtroom for her turn, she was misbehaved with, manhandled and beaten up by advocates and office bearers of the Bar. She has made a written complaint against certain counsel. The judge directed that her complaint be sent to the concerned SHO for appropriate action and that a copy thereof also be sent to the District & Sessions Judge (HQs), Tis Hazari Courts, Delhi. (iv) The Bar Association of Tis Hazari Court is restrained from going on strike or participating in any kind of boycott of any Court in Tis Hazari or any other Court.